Pip's Patch | Pip Pointon's website ... for all things Pip! Some time in the future the YDNPA planning committee is likely to receive a planning application concerning Aysgarth Methodist Chapel because, very sadly, it will officially close on April 22. The final service was held there on April 7. But it is unlikely a hot tub will be included in the plans as there definitely isn’t any space for it ! A hot tub in the garden is a sure sign these days that a converted barn will become a holiday let. This has become evident since all applications for barn conversions within the Yorkshire Dales National Park are now being decided in public by the YDNPA’s planning committee. One committee member proudly reported at the March meeting that the Authority had approved 100 barn conversions since the new Local Plan was introduced – and only about eight had been refused. But don’t think that all those approvals will provide accommodation for local families for, as one planning officer pointed out last year, the policy is aimed at conservation and not affordable housing for locals. At the April meeting six out of eight of the barn conversions in Craven District approved by the YDNPA planning committee will be primarily for holiday accommodation. 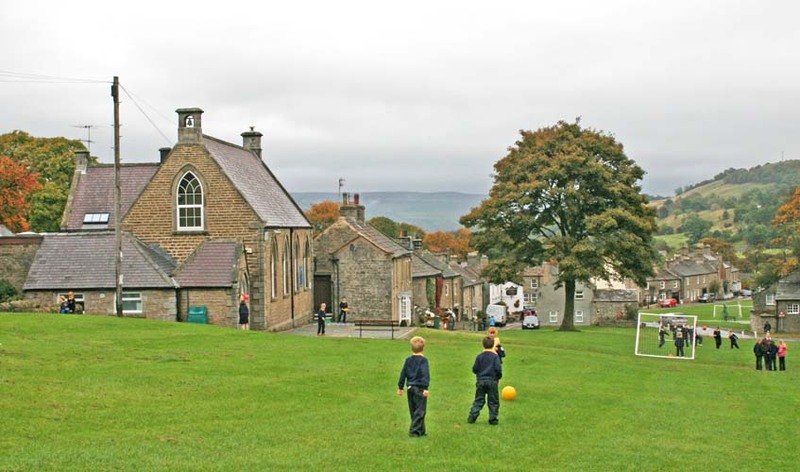 We do hope that West Burton CofE School continues (pictured above). A working party has been set up involving some of the BAWB Federation Governors and a group representing the parents of children at West Burton school. The Remembrance Poppies which have been such a special feature of Bainbridge since 2014 have now been taken down. I have posted the story about those poppies – and one remembering Pte Thomas Spence of Walden. The post Remembering a father and a great uncle not only tells the remarkable story of how Major Donald Rose MC had gone with the Ceylon Planters Rifle Corps to Gallipoli in WW1 and gained a commission with the Essex Regiment, but also the sad love story of a Durham Pal, Sgt Ernest Moore. For over 20 years the Association of Rural Communities has campaigned for the importance of farmers and landowners to the dales landscape to be recognised – and for the YDNPA to properly recognise the socio-economic needs of those living and working in the National Park. So the posts about farmers and the cost of the National Park boundary extension mark important landmarks, especially the former. That is mainly a report from the Association’s AGM – and its chairman’s acknowledgement of the benefits of the agri-environmental scheme in Wensleydale. For photographs of the Festival of Remembrance at Aysgarth church in November 2018 go to Aysgarth Festival of Remembrance. I missed a few YDNPA planning committee meetings in 2018 including that in August because David and I were in the midst of a truly memorable summer. First there was our wedding at Countersett Meeting House on Saturday July 21. That made history as it was the first wedding at that Meeting House since 1841. Then we chartered The Albion for our wedding blessing – and were told later that it was probably the first time the wherry had been involved in such an event. Do see my posts about our Quaker wedding (Parts One and Two) and the wedding blessing. A very big thank you to all our family and friends who helped to make these two occasions so special for us.